Despite the recognition that there are all sorts of federal research programs primarily directed at nonprofit-hosted research that would benefit from a determination that Bayh-Dole’s default provisions do not do a good job of promoting Bayh-Dole’s stated policy and objectives, federal agencies rarely use exceptional circumstance. Here’s a recent DOE proposal to use exceptional circumstances for energy efficiency research. Makes a lot of sense. What’s strange is how much effort Bayh-Dole requires a federal agency to go through to articulate the obvious. And that’s with Bayh-Dole claiming as a policy and objective that the law minimize the cost of administering policies in this area”–one would think that is policy objective would apply equally to the overhead of stating pubic policy objectives that required invention ownership handling that varied from Bayh-Dole’s default. One would have to believe that Bayh-Dole’s default was generally the best possible disposition of ownership of inventions once a contractor had acquired ownership–otherwise, the arbitrary default creates a huge administrative burden on federal agencies seeking to act in the public interest across all of the policy and objectives set forth in Bayh-Dole. Bayh-Dole creates its own awfulness–it “reduces” the costs of administrating good public policy by making those costs so high that federal agencies don’t bother trying–and therefore there’s no cost at all!
. . . justify the restriction or elimination of patent rights of those awarded a contract . . .
Not it. Bayh-Dole is directed to inventions, not patent rights. But there’s a more subtle slip. Those awarded a contract are not inventors–in the case of universities, they are organizations that receive federal funds on behalf of faculty investigators who have proposed projects worthy of public support. Only where an organization awarded a contract acquires ownership of an invention made under contract does Bayh-Dole apply. Bayh-Dole does not assume that those awarded contracts have any patent rights–or even any rights to any invention, and does not somehow smooth the way for those awarded contracts to get those inventions. Sorry for all the italics. I feel the need of emphasis here to make clear the difference between Bayh-Dole and the slant misrepresentations. The misrepresentations are not merely sloppy or loose–they patch write in place of what Bayh-Dole does something else entirely that sounds plausible to them and they expect will sound plausible to anyone who hasn’t read Bayh-Dole and who doesn’t know any history, and all of this plausibility is then attributed to Bayh-Dole as federal legal truth. Bayh-Dole’s lack of an assumption with regard to contractor ownership of inventions has been construed by at least one law professors to be just the opposite–that those behind the drafting of Bayh-Dole assumed that all federal contractors must have a patent agreement that requires employees to assign, and that their assumption was wrong. But, but, but… the people who conceived and drafted Bayh-Dole, including Latker and Bremer, knew full well that most universities did not have patent agreements with faculty. The University of Wisconsin, where Bremer harvested inventions for WARF, didn’t even have a patent policy. Knowing that–wouldn’t you think that Latker and Bremer would have included a requirement that inventors assign their inventions to their university “employers”? You know, just as Latker and Bremer had worked out for the IPA program, on which Latker claimed Bayh-Dole was based? No, Bayh-Dole’s authors did not assume everyone had a patent agreement with employees. They knew otherwise. And given that Bayh-Dole was directed at university-based federally supported research (the small company bit was a political throw-in–there weren’t many small business contractors and the SBIR program had not even been legislated into existence), Latker and Bremer must have gotten stuck trying to turn their contractual scheme to force inventors to give up ownership of inventions to their university hosts into a federal statute. Bayh-Dole does not even require federal contractors to have a patent policy, let alone a patent agreement. Bayh-Dole preempts federal statutes only when a nonprofit or small business acquires a patentable invention made under contract–otherwise, Bayh-Dole doesn’t apply. If an inventor for some reason wants a contractor to own an invention, and for some even stranger reason is not also a party to the funding agreement, then the inventor needs to assign the invention to a party to the funding agreement. Otherwise, the invention is governed by the various federal statutes that Bayh-Dole otherwise preempts–but does not repeal. Under those statutes and regulations, an inventor can request a determination of rights in most cases–but the federal agency has no obligation to allow an inventor to retain ownership. Whoever, under color of any law, statute, ordinance, regulation, or custom, willfully subjects any person in any State, Territory, Commonwealth, Possession, or District to the deprivation of any rights, privileges, or immunities secured or protected by the Constitution or laws of the United States . . . shall be fined under this title or imprisoned not more than one year, or both . . . Claiming that Bayh-Dole requires faculty inventors to sign over their inventions isn’t just a mistake–it’s illegal. After Stanford v Roche, there’s no excuse. Even NIST’s attempt to insert an assignment requirement doesn’t work. It’s a logical deadend everywhere but for inventions that a university already owns, say by equitable title but not legal title. We are being picky, of course. The general point that Dr. Thomas makes in his first bullet point is that federal agencies can determine exceptional circumstances and then require something other than Bayh-Dole’s default provision that owners of subject inventions can keep their ownership subject to Bayh-Dole default requirements with regard to that ownership. A DEC may only apply to a narrowly identified contract or class of contracts and does NOT automatically flow down to subcontractors. In the case of a determination under subsection (a)(ii), the statement shall include an analysis justifying the determination. is authorized to issue regulations describing classes of situations in which agencies may not exercise the authorities of those clauses. When an agency exercises the exceptions at paragraph (a)(2), (3), (5), or (6) of this section, it shall use the standard clause at § 401.14 with only such modifications as are necessary to address the exceptional circumstances or concerns which led to the use of the exception. Make only the necessary changes, but there’s nothing that restricts the classes of contracts to which the exceptions apply other than that a determination cannot be justified according to the requirements of Bayh-Dole, as reviewed by the Secretary of Commerce. (1) The contractor will include this clause, suitably modified to identify the parties, in all subcontracts, regardless of tier, for experimental, developmental or research work to be performed by a subcontractor. That is, whatever patent rights clause is in a nonprofit contractor’s funding agreement–including a clause modified by a DEC–must follow any assignment of a subject invention. Here Dr. Thomas’s apparent broader point would make no sense. Why would a federal agency determine exceptional circumstances and require a modified patent rights clause only to permit contractors to subcontract their way out of the modification? That’s like throwing a pebble in the Mississippi. 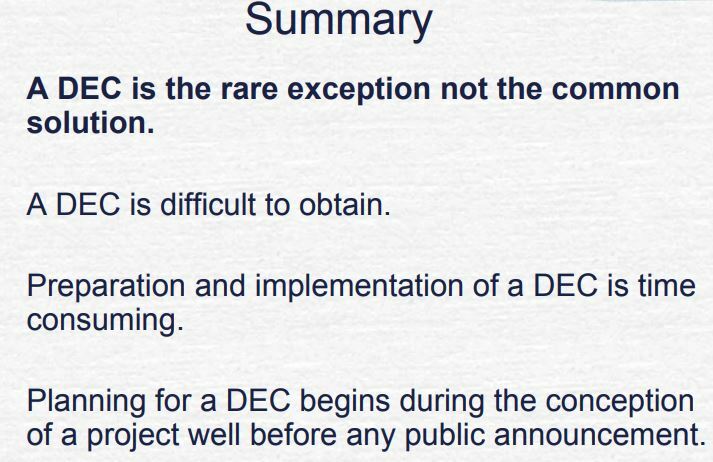 Typically, NIH will not approve a DEC for grants or cooperative agreements. NIH presumes that the policy and objectives of the Bayh-Dole Act are generally best served by implementing the standard patent rights clauses in grants, contracts, and cooperative agreements. Nothing here that singles out contracts for modification and not other grants or cooperative agreements. NIH views the use of the exceptional circumstances authority to be appropriate where there is no lesser means of achieving an important programmatic goal, consistent with the policies and objectives of the Bayh-Dole Act. NIH encourages ICs and proposed recipients of IC funds to explore alternative means of achieving programmatic goals in lieu of DECs. NIH has been very successful in the past in avoiding DECs by discussing programmatic goals with known or anticipated funding recipients and agreeing on mutually beneficial terms and conditions. That is, why use the cumbersome procedure of determining something to be in the public interest that does better than Bayh-Dole’s arbitrary default when one can work around Bayh-Dole altogether? The point of a DEC is that the default ownership and/or the default requirements on that ownership do not best promote Bayh-Dole’s goals. But the NIH instead has a policy to work around Bayh-Dole. Institutes and Centers (ICs) are to “explore alternative means” to have contractors do things that they are not required to do by Bayh-Dole’s defaults–but without requiring the contractors to do those things and instead “agreeing on mutually beneficial terms and conditions”–that is, contract for different terms without making those terms formally part of the funding agreement. A side agreement, if you will. A scheme. 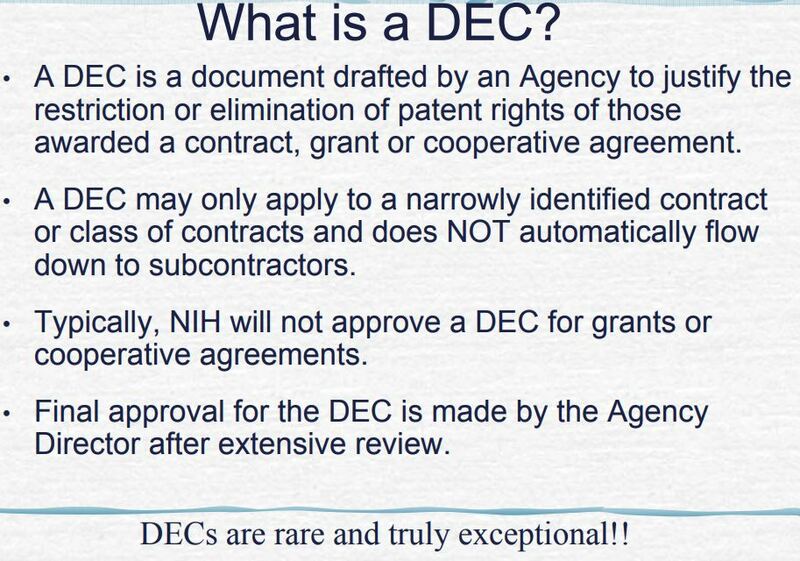 Perhaps then when Dr. Thomas asserted that the NIH won’t approve DECs for grants and cooperative agreements, he meant that the NIH didn’t bother with DECs because it could withhold funding until the nonprofits agreed on modified terms outside the funding agreement. In contracts, especially with competitive bidding, perhaps doing side deals with all involved would look bad, and so there the NIH would consider DECs. Final approval for the DEC is made by the Agency Director after extensive review. DECs are rare and truly exceptional!! Given that the NIH supplied the principal drafter of Bayh-Dole, we might expect the NIH to avoid DECs and adopt Bayh-Dole’s default provision. It is that default provision, after all, that enables a pipeline of patent monopolies to pass through the hands of nonprofits to be delivered to favored pharmaceutical companies or to venture speculators hoping to sell up to those companies. This pipeline was first enabled by the NIH’s IPA program, which was shut down a decade later for being ineffective, doing sweetheart exclusive deals with pharma companies, and running generally against public policy by seeking almost always to do those exclusive deals, despite alternatives and despite the ineffectiveness of the attempts. The Bayh-Dole Act has been successfully implemented by the widespread election of title to subject inventions by government grantees and contractors, and the subsequent commercialization efforts of those grantees and contractors. “Election of title” is of course a misrepresentation, as was made clear by Stanford v Roche. Contractors could elect to retain title. But Bayh-Dole is not “successfully implemented” because contractors acquire title and elect to keep it, or even because they make “commercialization efforts.” The primary standard of success in Bayh-Dole is utilization of inventions, practical application, with benefits available to the public on reasonable terms. And then also maximum participation of small businesses, including in development efforts; collaboration between universities and industry–not just a university collaborating with a favored company in an industry; free competition and enterprise; and when there is commercialization or public availability, the use of United States manufacturing and labor. On these metrics, there was and is no good evidence for Bayh-Dole’s success. AUTM does not collect this information. Bayh-Dole does not require federal agencies to collect this information, and if they do, they are required to keep it exempt from FOIA disclosure–perhaps in violation of FOIA! But NIH made it policy that Bayh-Dole was successful. The 2013 revision of the PHS Technology Transfer Manual removes the “Policy” and “Alternatives to DECs” sections. We will discuss the new NIH DEC guidance next. This entry was posted in Bayh-Dole and tagged Bayh-Dole, Bremer, exceptional circumstances, Latker. Bookmark the permalink.